A) That Target stores are selling red "Kabbalah bracelets" that you get for a shekel from the scary old lady at the Kotel? B) That they are so popular that Target has none left? C) That these "century-old"tools weigh a pound? D) That Target seems surprised (Hmmmm) that they can't find anything similar to this item? E) All of the above!!!!! Don't have one?Choose from above to enter and we'll set one up for you. Availability: We're sorry. This item is temporarily unavailable. 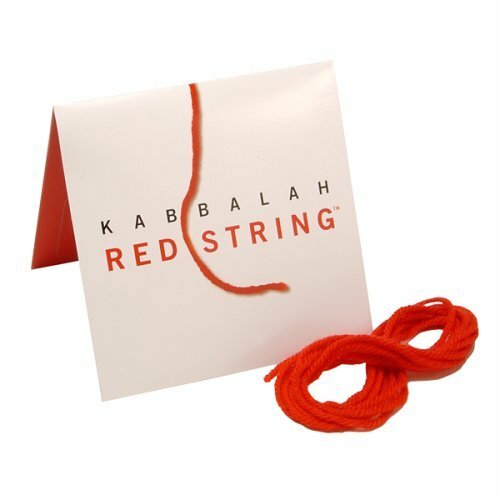 A centuries-old spiritual tool used by Kabbalists, this red string is believed to protect against the evil eye, a negative energy source. What makes this particular piece of string so special is, in part, the fact that it has traveled to Israel, to the ancient tomb of Rachel the Matriarch, and returned, imbued with the essence of protection. The string is tied to the left wrist—the left being the body and soul's receiving side—and worn to essentially deflect the negative energy brought forth by unfriendly and envious stares, unkind glances and looks of ill will. A feeling we've all experienced, the evil eye is considered by Kabbalah to be a powerful force and an influential factor in regards to achieving goals and everyday well-being. The string draws upon the connection to and awareness of Rachel and must be tied on by a loved one and sealed with Rachel's protective energy by reciting the Ben Porat prayer (included on a card). From The Kabbalah Centre. 72L". Hmm. We were unable to find any results for that item.